ES-335 Bass - Vintage Sunburst, 4-string bass guitar from Gibson belonging to the ES-335 Bass model. Taking a look at the manufacturer's historic catalog, it is difficult to find a model that isn't a four-string version of a guitar already in existence. There was the Ripper and the Grabber, which were a sensation in their time, but the four and five string-guitars of the brand have never enjoyed much success. However, since we are very curious at Audiofanzine, we decided to review an ES-335. Not the '58 guitar, but a modern version of the EB-2 ─ its equivalent in bass guitars ─, which was taken out of production in 1972. The least that we can say, if we were to dig in the history of the company, is that its founder did not enjoy the fruits of his labor for a long time. In 1894, a shoe seller turned into an improvised luthier to invent a new design of mandolins and, afterwards, guitars in a workshop right next to his house in Kalamazoo. At the time, the mandolin was the Ukulele of today: a mediocre musical instrument, generally speaking, available for little money and not very playable. The original idea of Orville Gibson was simple: transform the toy into a quality instrument. He dismissed the overall design of the instrument and proposed drafts of a bent soundboard with a curved back and, most particularly, a much more solid and louder overall design, in comparison to what similar products had to offer. And so the inventor of the modern mandolin ventured into entrepreneurship: he founded the Gibson Guitar Company in 1896 and was issued a patent due to the novelty of the modifications he brought to the instrument, whose origins can be traced back to Italy in the 19th century. Success came quickly and Orville, who was still working on his own in his workshop, couldn't cope with demand. Five businessmen who had a keen sense for business decided to invest in his company, so in 1904 a factory was created to develop and market Orville's ideas. The five tycoons would exploit the inventor such, that they would end up paying him $500 per month (a bit more than $1700 of today!) until the end of his days, which wouldn't be too glorious: the poor man died in a psychiatric hospital in 1918 after being locked up for two years. After the death of its founder, the brand continued business as usual. They benefited from the collaboration of big names like Loyd Loar (one of the precursors of the electric era) and Walter Fuller, who created the first electrical pickup for the company (originally conceived for a lap steel or Hawaiian guitar) that would end up inside the ES 150, the first electric guitar marketed by the company in 1936. During WWII musical instrument production became less important. The company would become a spare part supplier for the US army. Things wouldn't return to normality until 1944 when Gibson was bought by a company that doesn't exist anymore: CMI (Chicago Musical instrument). A certain Ted McCarty would then take charge of the company to make its figures rocket in a couple of years (during his tenure production would increase from 5,000 guitars to 100,000 per year). His commercial strategy was simple: open up the catalog to innovation. The brilliant manager, who was also an engineer and musician (but like Léo Fender, he was not a guitarist), would be behind the development of the Tune-o-matic, the brand's first adjustable bridge that saw the light of day in 1951. He is also the man in the shadows who has been attributed the design of the Les Paul. The legendary PAF pickups, the Explorer and Flying V guitars, the Firebird and even the SG, which appeared in 1961 to replace the Les Paul for seven years, were born in this era. No matter who you ask, everybody will agree that this period was the brand's golden era. But the good times would only last 18 years: the company was once again bought by a couple of businessmen (to form the Norlin company). Production would be gradually relocated out of Kalamazoo until the factory closed its doors in 1984. It was a big mistake: most of the best qualified employees would not follow the company and stayed in Kalamazoo to create the Heritage Guitars brand. This marked the beginning of the brand's decline that would last from 1969 to 1983. It would be rescued from bankruptcy by Henry Juszkiewicz, who has been running the company ever since, and David Berryman. When Gibson entered the solid body guitar segment, the policy of the company led by Ted McCarty was to preserve the quality of handmade manufacturing and to try to highlight the work of the guitar maker. Given the commercial success of Léo Fender and his Telecaster, the Gibson boss would not spare criticisms, describing it as a vulgar wood plate. And so, the Les Paul would see the light of day. While we can affirm, without shocking anyone, that its design was well above Fender's flagship model, its success, in relation to the latter, was less evident. First of all its format, a bit shortened, deranged the fans of the brand. But it was most of all its weight that tipped the balance. In 1958 McCarty introduced the ES 135, a versatile and light hollow-body equipped with PAF. It would thrill bluesmen so much that its production would never be interrupted. 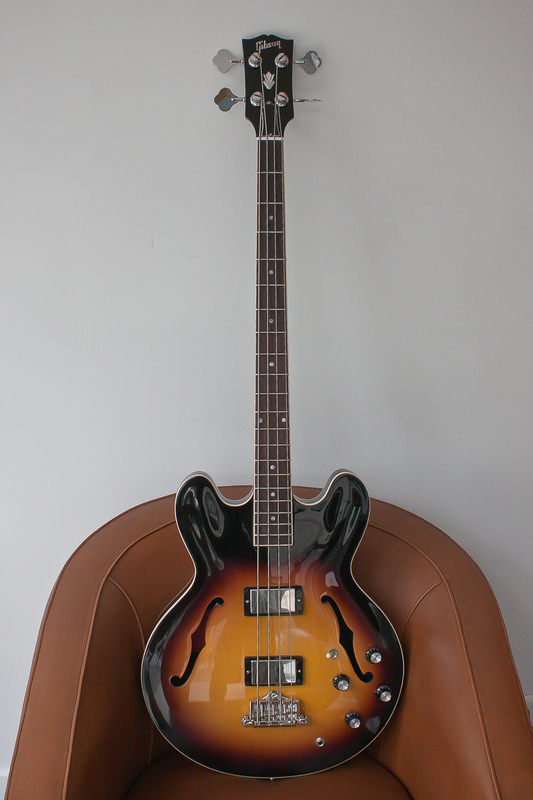 That same year, the EB 2 followed in its footsteps to satisfy bass players. 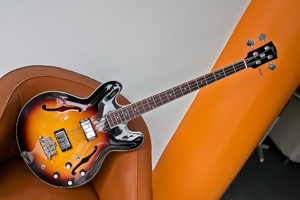 This short-scale hollow-body bass guitar was produced until the first half of the 1970's. Our ES 335 retakes the line of the EB-2 but with different electronics and another scale. To begin with, the neck gets a standard 34" scale length, which allows us to benefit from an ideal string tension (the highest note on the G string ends with a sharp D on the 20th fret). 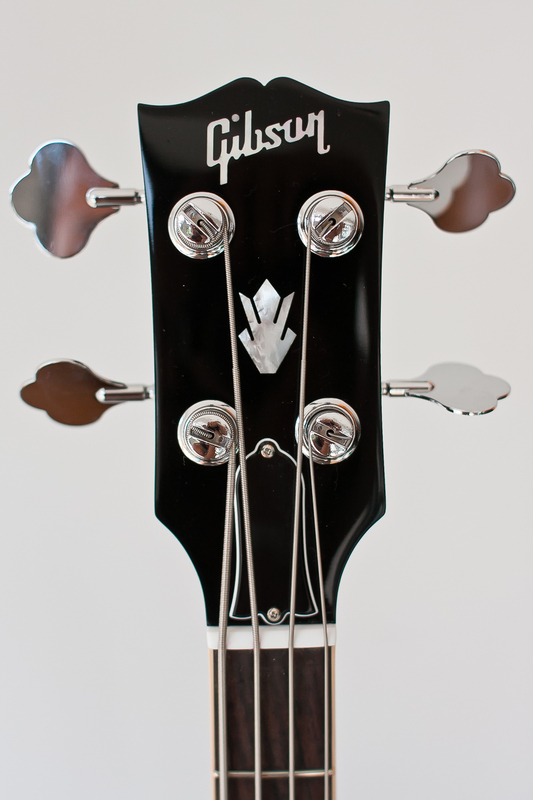 Gibson already tested this scale last year on the Midtown series of four-strings in a quarter-size body. 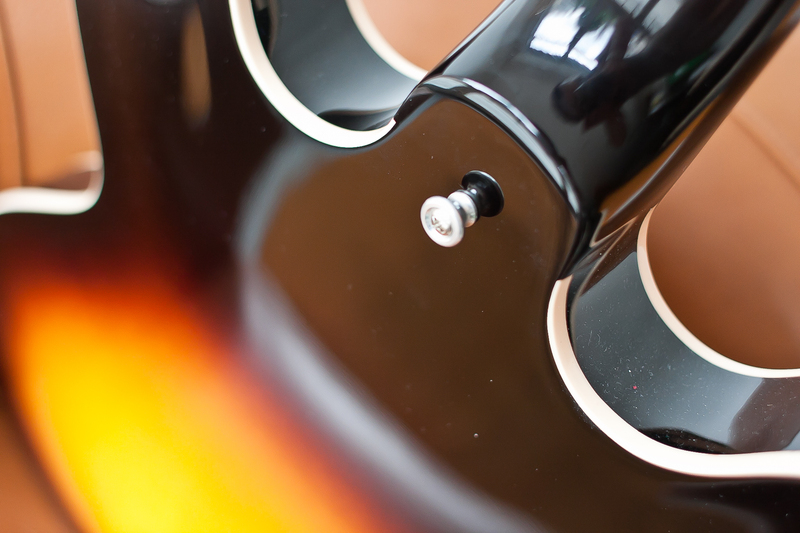 Regarding the pickups, the ES-335 features a dual humbucker configuration. Their location was considered with particular care. 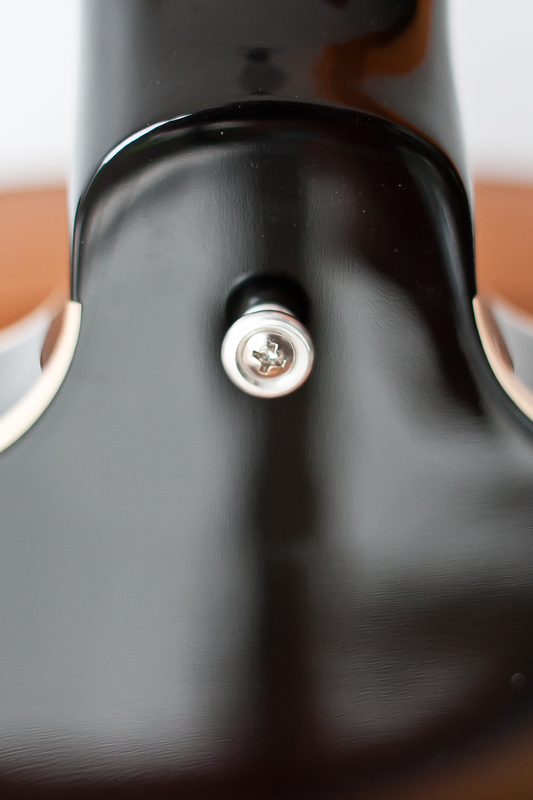 On the EB-2, the neck pickup was right next to the neck, while on the 335 the neck is a couple of centimeters farther. The result is preciser, at a height where the strings clearly float less, a bit above where we would find a Jazz Bass pickup. The manufacturing quality of the instrument is simply impeccable: a beautiful nitrocellulose lacquer perfectly applied on top of a three-color paint that highlights the arched top and the curved back, a nicely carved body and neck binding (if you look closely, it seems like it was almost handmade, it's so beautiful). 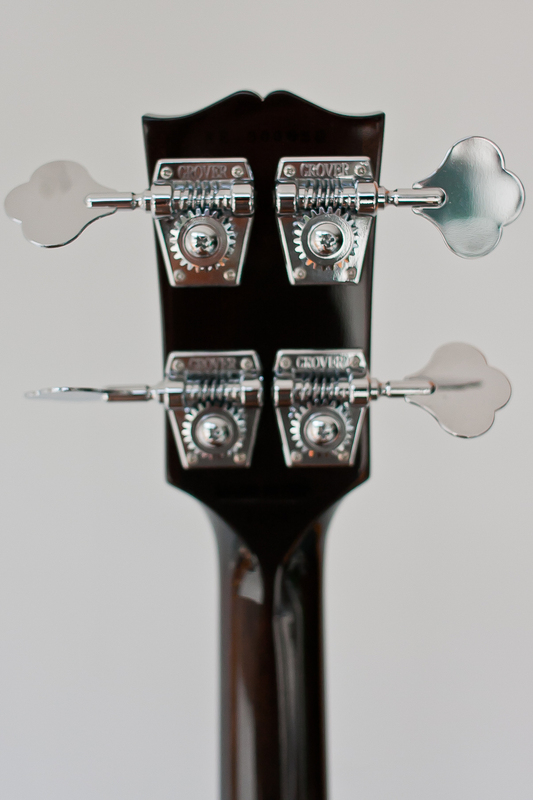 Two f-holes embellish the instrument's top. The body and top are of maple, like the neck. The fretboard is of rosewood. The bass has a massive three-point bridge and, obviously, passive electronics. Plus, it features two volume and two tone controls. A three-way pickup selector rounds off the control panel and allows us to quickly bypass one of the pickups. The jack input is on the bass' top, far enough from the pots. The instrument weights 9 lbs (3 kg) or so, which makes it very comfortable to play. The only criticism I can make to this bass guitar, even if it is almost insignificant, has to do with the strap button: it is on the bottom of the neck joint not on the side. So it makes me have to play seated, which is not bad in itself, but it does limit the movement on stage (I might have been a dancer in another life...). Definitely a bad point in terms of design: since I don't have an arm particularly longer long than the other, I don't like to play with a bass on my knees and I can't see myself playing a whole set seating down, I'm a bit disheartened. Otherwise, even if no hollow body bass has ever really tempted me ─ excluding a Violin (it's the groupie in me) and a Warwick Starbass which took my breathe away when I reviewed it ─, I must admit that this Gibson is exceptional when we put it on our lap and listen to it. 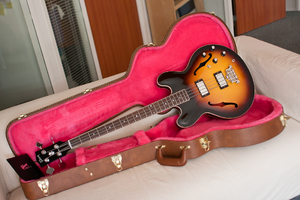 It's a real gem and it proves that the manufacturer can make as good basses as guitars. 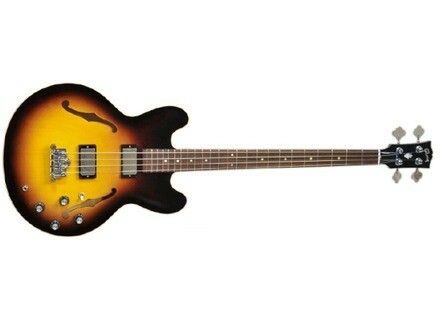 I will not beat around the bush: the ES-335 sounds like a perfect passive bass. A gritty character but with lots of finesse for a set of humbuckers. I was positively surprised to find myself playing an amazingly versatile bass. Believe me or not, it can do anything and the balance between both pickups can be deceiving. In fact, when I pick up this bass I enter a I-want-to-play-blues state of mind. And then, while I'm playing I realize that I could play almost anything that I play with my Jazz Bass. Above the 12th fret it is still playable, but when we reach the 15th and the last fret it can be a bit harder to play. It's a pity, especially considering that it sounds really nice in the high range. Most stunning of all are harmonics: natural, they sound like a choir of mermaids from the Odyssey with an enhancer. Artificial, they are as accessible as a candle in the middle of the Vatican. And you can hear that in the signal produced by the instrument: every note is full, lacking no fundamental frequency. A simple and beautiful sound, without any tricks nor excesses, a bit old-style, but in no way outmoded. The neck pickup is heavy and accurate with a certain vintage-PB-like something. 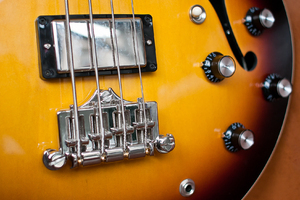 The bridge pickup goes from twangy low mids to slamming dynamics. I didn't want to play slap bass in the examples to avoid being scolded by the most traditionalist amongst you. But I can assure you that even then, the 335 excels. It's like magic ─ long live passive and well-balanced instruments! In terms of sound, it can hardly get any better! For less than 2000 euros, it's an exceptional instrument. Maybe the ES-335 isn't an obvious choice, but that has more to do with its design than with its tone, which I personally enjoy very much. Some purists might say that it sounds like a bass is supposed to. And the quality of the sound will be obvious even to newbies: it's a perfectly distinguishable color. I can picture it perfectly in a recording studio being used on pop and rock songs, as well as on other styles which we wouldn't expect from a descendant of the EB-2. Hats off!